Madrid twice failed to flog bailed-out Catalunya Banc. Selling 6.4 bln euros of the bank’s bad loans to the U.S. buyout group will help a privatisation – but only after Spain stumps up another 572 million euros. In return, Madrid gets some potential upside. Strictly potential. 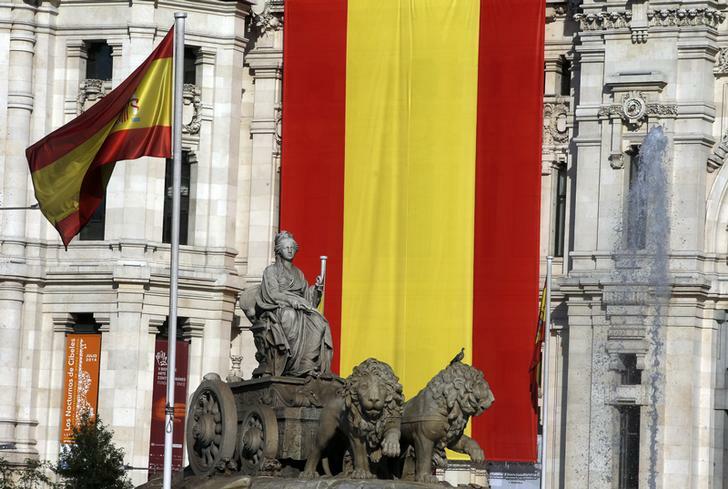 Spanish flags are displayed at Madrid's Town Hall June 18, 2014. U.S. buyout group Blackstone on July 17 bought a mortgage portfolio from Spain’s nationalised Catalunya Banc for 3.615 billion euros ($5 billion), a 43 percent discount to the loans’ face value. The deal comes ahead of the sale of the bank itself, with bids due July 18. The mortgage portfolio will be transferred to a securitisation fund at the 4.2 billion-euro book value of the loans. Blackstone will pay 3.6 billion euros while Spain’s bank restructuring fund, the FROB, will contribute 572 million euros. The package of mostly home loans, worth 6.4 billion euros at face value, is the largest of its type ever sold in Europe, according to the FROB. N+1 advised the FROB and coordinated the sale, while Baker & McKenzie provided legal advice.